Bond was one of the pillars of mid-eighteenth century musical life in Coventry (as organist of the church that was to become the Cathedral) and Birmingham. His "Six Anthems in score", 1769 were sufficiently popular to run to six editions. 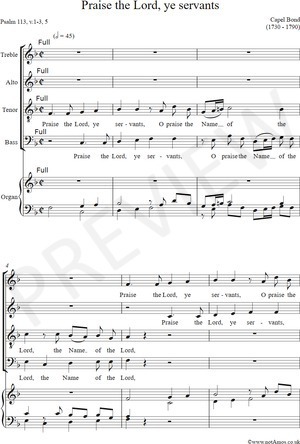 They were written for parishes with organ, (the bass line is also figured) but the composer's directions imply that they could also be performed unaccompanied. Praise the Lord, ye servants: O praise the Name of the Lord. Blessed be the Name of the Lord: from this time forth for evermore. The Lord's Name is praised: from the rising up of the sun unto the going down of the same. Who is like unto the Lord our God, that hath his dwelling so high: and yet humbleth himself to behold the things that are in heaven and earth?